The UK economy barely grew in the second quarter of 2011, GDP up just 0.1 per cent, as the IMF said deficit reduction should not be at the expense of growth. The UK economy barely grew in the second quarter of 2011, GDP rising just 0.1 per cent – down from its initial 0.2% estimate. Responding to the grim news in the UK and the eurozone – Italy’s credit rating was cut by Moody’s overnight – the IMF said a stimulus was needed, that a eurozone solution is “overdue”, and warned governments against pursuing deficit reduction at the expense of growth. • In current price terms, compensation of employees increased by 0.4 per cent in 2011 quarter two. And to further dampen the mood, the IMF also warned a global recession in 2012 “can’t be ruled out”, citing the possibility “activity will turn downwards”. These figures come as no surprise. They have been attributed to low consumer spending. We have too many extremities in our economy that need to be adjusted in line with our current economic situation. VAT at 20% is hurting the economy badly. The high cost of fuel can also be blamed for hitting consumers where it hurts and hurting growth. Lowering both of these significantly would bring an instant boost to the real economy. One assumes that Osborne is holding off on things like this until it’s closer to election time, the problem being that our economy is laying on the floor bleeding to death now… and needs more urgent attention than he is giving. "The French and the German economies have slowed to a standstill"
What with Theresa May’s cat and David Cameron telling us to ‘pay off our credit cards’ this year the Tories have decided to dedicate their party conference not just to coming across as heartless, greedy bastards, but as profoundly stupid as well. Ray_North – I’d have thought that the Labour Party would have had a better conference if it had been used to get a new leader. All people like you are doing is giving the government an easy ride. 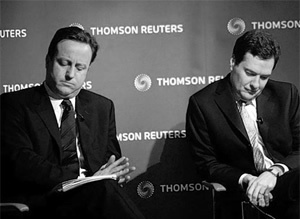 Think more Charles Clarke and John Reid and less Gordon Brown and Ed Balls and Labour may stop tanking in the polls….